For the next couple of months the world will be focusing on the racist SB 1070 law which is slated to take effect on Thursday July 29th. What most people don’t know is that it will not stop there, HB 2281 an anti-ethnic study will now be the next bill that will come into action, a good old fashion censorship law that will codify the Western “triumph” with an emphasis on Greco-Roman culture in schools in the state of Arizona. This new law would be applied to all schools in the state of Arizona, it will determine what books are acceptable in the state, it is slated to go into effect on January 1st 2011. This Inquisitorial mechanism has already decided that Occupied America by Rodolfo Acuña and Pedagogy of the Oppressed by Paulo Freire are un-American and preach the violent overthrow of the American government. What is developing in Arizona is becoming more and more scary if you ask me, these laws are genocidal! One law attacks the physical presence of red-brown people; while the second attacks their minds and spirits. In general, the philosophical foundation for Raza Studies are several Indigenous concepts, including: In Lak Ech, Panche Be and Hunab Ku. Over the past generation, the first two concepts have become fairly well known in the Mexican/Chicana/Chicano communities of the United States. The third concept, Hunab Ku, is relatively less well known, though it actually forms the foundation for In Lak Ech – ‘Tu eres mi otro yo – You are my other self’ and Panche Be – ‘to seek the root of the truth’ or ‘to find the truth in the roots’. As explained by Maya scholar, Domingo Martínez Paredez, Hunab Ku is the name the Maya gave in their language to the equivalence of the Supreme Being or the Grand Architect of the Universe (Hunab Ku, 1970). Such concept is an understanding of how the universe functions. These three concepts are rooted in a philosophy based on maiz. Maiz, incidentally, is the only crop in the history of humanity that was created by humans. Also, the Indigenous peoples of this continent are the only peoples in the history of humanity to have created their/our own food – maiz – a food so special that it is what virtually unites not simply this continent, but this era. These three maiz-based concepts, in effect, constitute the essence of who we are or who we can be; human beings connected to each other, to all of life and creation. Part of creation; not outside of it. This is the definition of what it means to be human. While these concepts are Indigenous to this continent, they also exist generally in all cultures. Despite the destruction of the many thousands of the ancient books of the Maya (along with those of the Aztecs-Mexica) by Spanish priests during the colonial era, these Maya-Nahua concepts were not destroyed, nor are they consigned to the past. Today, they continue to be preserved and conveyed via ceremony, oral traditions, poetry and song (In Xochitl – In Cuicatl) and danza. And they continue to be developed by life’s experiences. In Raza Studies, these ideas are designed to reach those that are unfamiliar with these concepts, including and in particular, Mexicans/Chicanos and Central Americans and other peoples from the Americas who live in the United States and who are maiz-based peoples or gente de maiz, albeit, sometimes far-removed from the cornfield or milpa. Despite their disconnection from the fields and despite the disconnection from the planting cycles and accompanying ceremonies – and in many cases the ancestral stories – their/our daily diet consciously and unconsciously keeps us connected to this continent and to the other original peoples and cultures of this continent. Ya Basta! We will not comply! Immigration is still a subject that is making news in the US, last month there was the death of Sergio Adrian Hernandez and the week ahead is a week of resistance entitled “We will not comply” that will be happening throughout Arizona and the US. 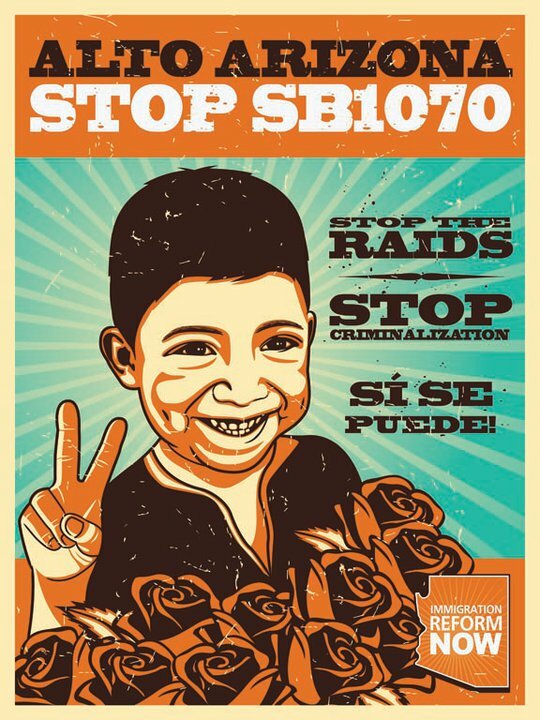 SB1070 has still not been overturned, people are now asking the Obama administration to intervene to make sure that communities will not be terrorized by this bill. Seeing as how the administration is not doing anything to help this cause, the people are taking action in making their voices heard and making sure that everyone knows that they will not comply with this racist law. 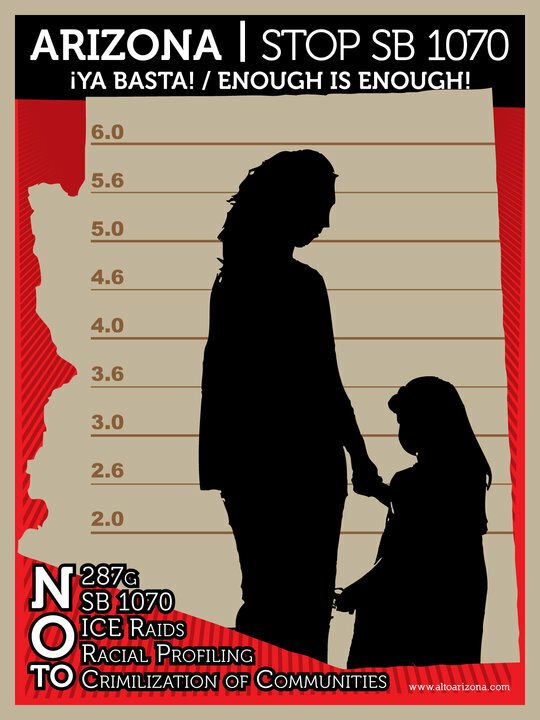 July 29th is a significant date, this is the date that SB1070 is suppose to be implemented. Actions will be planned for the week leading up to this implementation, laws that do not serve humanity must be disobeyed. Jan Brewer, the governor of Arizona, has continued to defend this law, she ignores the seperation of families and has even publicly stated that most immigrants in Arizona are « drug mules ». Maricopa County Sheriff Joe Arpaio has already stated that regardless of the legal challenges ( a civil rights group and the United States Justice Department have asked that the law be temporarily stopped) will be conducting aggressive sweeps across the city after midnight on the 29th of July. Senator Russell Pearce, the author of SB 1070, is planning a national event to strategize how to spread 1070 to other states across the country. Tonight the Sound Strike (Rage Against the Machine, Conor Oberst and the Mystic Valley Band) are performing a concert at the Hollywood Palladium to help kick off the week of action for human rights that will be happening in Arizona. 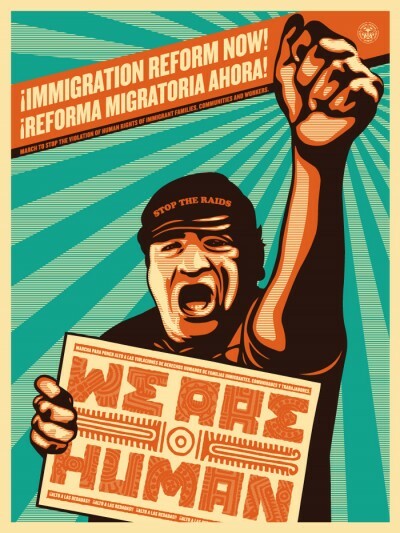 This is a week of resistance against all racist policies that criminalize migrant people and separate their families. They are asking Obama to not comply with Arizona’s SB1070, as it only terrorizes their communities if the federal government cooperates with it. 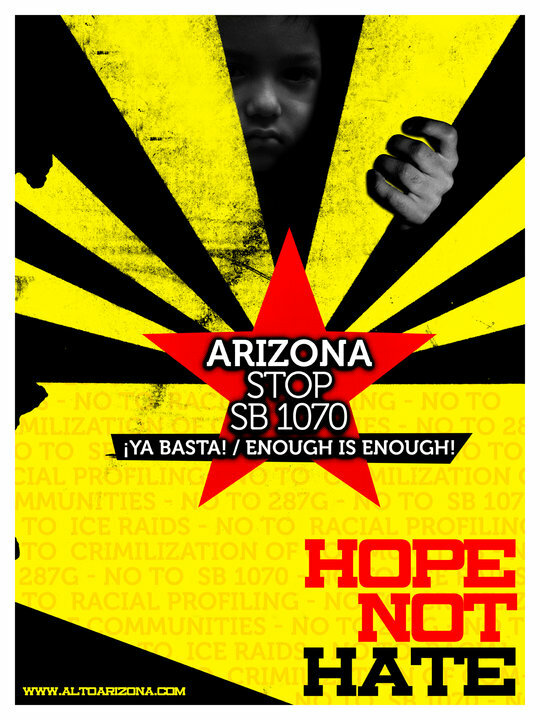 They are demanding that Arizona institutions such as cities, towns, police jurisdictions, school districts and businesses to publicly state that they will not comply and cooperate with SB 1070. All people are invited to go to Phoenix to stand in solidarity with the communities of Arizona to stop the implementation of SB 1070. If you are not able to make it to Arizona, you are encouraged to organize actions in your communities to show solidarity! On July 29th, resist and join in solidarity with Arizona; do not carry ids, do not go to work, and do not buy anything. The people united will never be defeated! Ya Basta! If you have been following the news in the last year, I am sure that you have noticed that racial profiling has been the subject of major news stories: Arizona’s new immigration law and the Oscar Grant story. 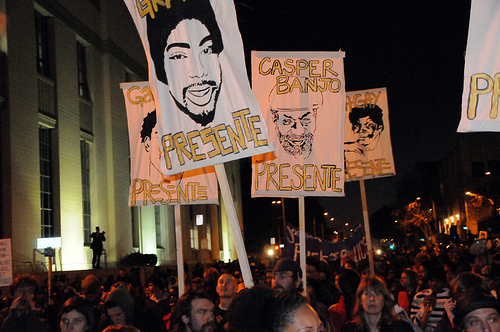 The Oscar Grant story has made people seriously look at race issues and police brutality, an event that took place on New Years day 2009 is still making headlines today, in a community that feels that no justice has been served. What made this story so real and undeniable is that it was captured on many cell phone and digital cameras, it is hard to ignore what happened when it is caught on such a medium. We can hardly believe our eyes. More and more we will be witnesses to police brutality thanks to the use of recording media, a good example of this was shown with the G20 protests in Toronto where people could witness the obvious denial of civil liberties by the police department. The Oscar Grant story has enraged a community that feels that they are victims of racial profiling and police brutality on a daily basis, and the verdict that came out this week is proof that this sentiment is not completely unfounded.It is a fact that minorities are the target of police harassment, searches, and brutality; this is something that must change in our society, people should be allowed to walk freely in the streets without fear of being the target of brutality. 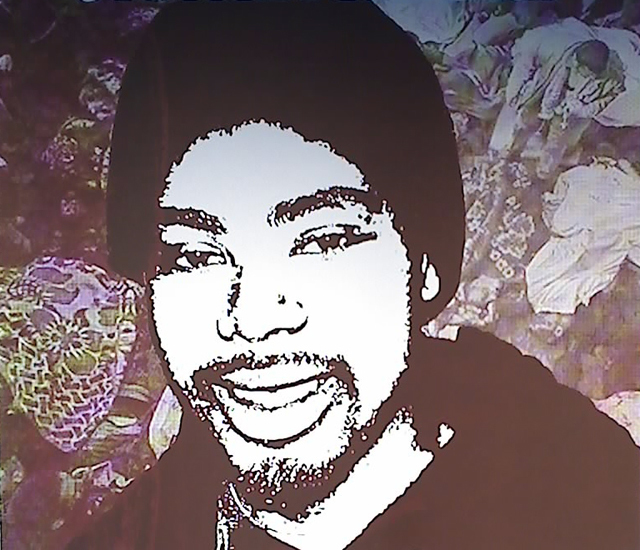 The shooting that occured in the Oakland BART station has been labeled as “involuntary manslaughter” and an “execution”, officer Mehserle resigned his position and plead not guilty to the charge that was brought against him by the Alameda County prosecutors. His defense was that he was reaching for his taser, but instead mistakenly reached for his gun when he thought that Grant was reaching for a pistol. Pretrial filings argue that his client did not commit first-degree murder and asked the Los Angeles judge to instruct the jury to limit its deliberations to second-degree murder or aquittal. On July 8th 2010 the jury returned its verdict: Mehserle was found guilty of involuntary manslaughter and not guilty of second-degree murder. The inital protests after the trial were peaceful, but some looting, arson, destruction of buildings, and small riots happened after dark, a total of 80 people were arrested. The sentencing date is set for August 6th 2010. On July 9th, the US Justice Department opened a civil rights case against Mehserle; the federal government will be able to prosecute him independently for the same act under the seperate sovereigns exception to double jeopardy. The Department of Justice will be working with the US Attorney’s office in San Francisco and the FBI. Unfortunately this is a scene that we know all too well, we must be vocal about the way that police forces are treating minorites all over the country. Racial profiling is wrong and, as we have seen, has deadly consequences. This could of been avoided, we must change the system that is causing this repression. The police should be there to serve and protect all people no matter what colour their skin might be, they should not instill fear in the hearts of mind of communities. I feel that more and more we are being ripped away our freedom to assemble in the streets to voice our dissent towards the wrongs committed by our governing bodies. Which way is our society heading? We must stand up and keep what liberties we have left! 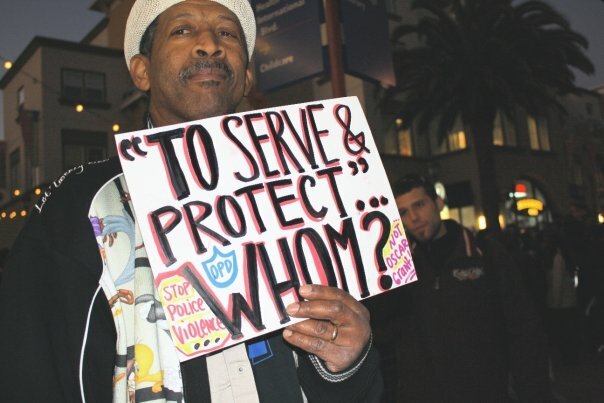 Justice for Oscar Grant and all others that have fallen due to situations like this one! There will be no peace until there is justice! Never forget that the streets belong to us and we must us them when we see fit to voice our opinions and struggles… Here are some videos on the story to help everyone have a more informed opinion and view of what is happening in Oakland right now. Peace and Solidarity to all people that struggle to be viewed as equal!